I have a 2011 MacBook. Along the left edge (looking at it from the normal typing position), near the front, there is a small silver button which is flush with the rest of the case. When pressed, a small series of tiny lights beside it flash green before going dark again. Nothing else happens. Can anyone explain what this button does? This is your battery capacity indicator. The number of lit dots indicates how much battery you have left. 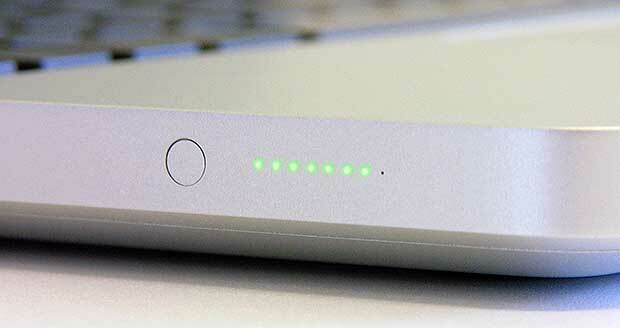 The battery indicator lights are located along the left side of the computer. This allows for quick and easy verification of the battery's charge status while the computer remains solidly in-place. When you press the battery indicator light button, the corresponding flashes (or pattern of flashes) presents either the current charge status or a diagnostic status. The KB also has a chart of the behavior shown when the indicator is pressed. This allows to check the charge of your battery. When the battery is full all the green lights should flash. Not the answer you're looking for? Browse other questions tagged macbook hardware . How can I diagnose hardware issues on my MacBook Pro 13" (mid 2010)? What port is this *picture* (mid 2007 13 inch macbook)? What purpose does this broken plastic clip serve in the MacBook Pro? What is this button on my MacBook Pro Touch Bar? What is this macbook keyboard popup bubble?